“Is the software installed?” asked my friend Kenny Cole. Our eyes tracked the mouse on screen as I right-clicked on a project and picked Open With –> Expression Blend 4. Diodes flickered. Hard drives whirred. A dialog box appeared. Kenny’s angular face raised an eyebrow. “A modal dialog ... interesting start,” he said. “Yes,” I replied with a nervous laugh, “well, this only happens once in a blue moon”. I moved the mouse and clicked Close as fast as possible. Diodes flickered. Hard drives whirred. A dialog box appeared. I could see the frown on Kenny’s face out of the corner of my eye. “Maybe you should click that link to install an S – D - K and make the software happy,” he said. “Oh, sure”, I replied. 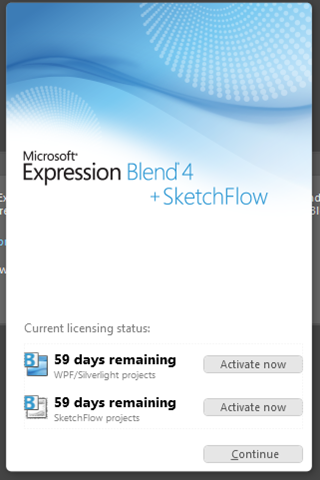 I clicked the “Install the Expression Blend SDK for Silverlight 4” link. Diodes flickered. Hard drives whirred. A browser appeared. “It doesn’t appear to be installing anything”, Kenny observed. “It appears to be an ad for Microsoft Office”, Kenny said. 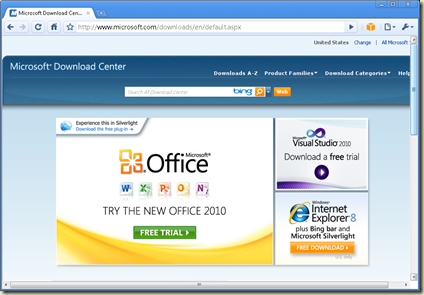 “Well,” I replied, “it’s the home page of the Microsoft Download Center. Presumably from here you can search for SDKs”. “And then ... presumably ... you can download and install them one by one?”, he asked. “Ah ... right. Let’s just come back and do that later. I’m sure it’s ready to start now”. I flipped back to Expression and clicked the Close button. Diodes flickered. Hard drives whirred. A dialog box appeared. Kenny’s frown turned to a scowl. “Three times!”. “Yes, well, it’s a security warning,” I said while clicking the Yes button. Diodes flickered. “I mean, you can’t be too secure these days, right?”. Hard drives whirred. “It’s just being cautious, you know”. A dialog box appeared. Kenny stood up, and started walking towards the door. “Wait!” I cried - “check out these rounded corners!”. On the bright side, at least you didn't get a "Do you want to debug using the selected debugger?" error message. Sometimes you wonder WTF they are thinking. That's why it costs $599/license my friend. 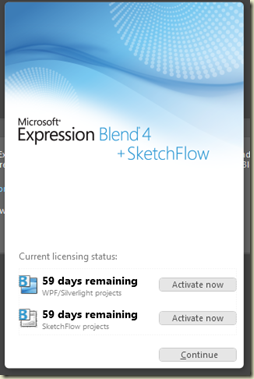 Funny thing is you can't get just Blend/Sketchflow by itself.